EDIT: Giveaway is officially closed. Congratulations to the randomly chosen 45th commenter, Sheree! Leaves are just beginning to fade from green, but soon the trees will be bursting in vibrant reds, oranges and yellows. 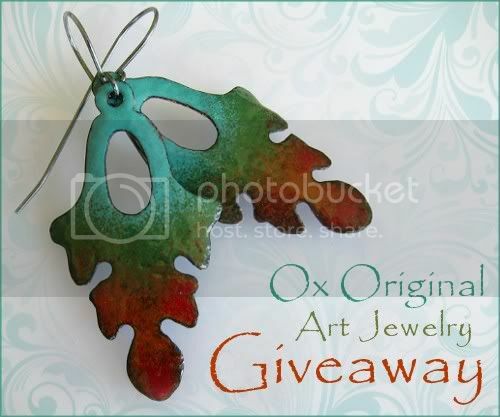 Patsy of Ox Original Art Jewelry is celebrating fall by giving away a gorgeous pair of her autumn leaves enamel earrings in green, rust and brown colors. Enameling is the ancient art of "painting with fire." Leaf earring shapes are cut from a copper sheet and coated many times with powdered glass and fired in a kiln to achieve that glossy brilliance. Each leaf measures 1 1/8" x 2" that dangle from an oxidized, sterling silver earwire. For years Patsy labored at her easel to capture the essence of Colorado in paint. Her artistic hunger found a new dimension the moment she fashioned wire and beads into a simple bookmark. Now she uses precious materials to express her vision in ways that painters could not. Making the common uncommon; creating the unusual from the usual. That is her artform. Giveaway is open worldwide to entrants at least 18 years old. I will be pulling a number from my random.org top hat after 11:59pm EST on October 15, 2011, and the corresponding commenter will win! Patsy will contact that lucky soul for a mailing address. If she doesn't hear back from the winner within 3 days, a new number will be drawn. Mandatory Entry: Browse around Ox Original Art Jewelry Etsy shop then comment on this post with your favorite handmade item and a way to contact you, preferably an email or Etsy shop. 1. Like that same item by using the facebook like button on the right sidebar of Patsy's Etsy listing and leave a comment here with the number of likes to the right of the button OR share it on your business page and include the link when commenting. 3. Buy anything from her Etsy shop. Use coupon code "OCTOBERDISCOUNT15" to get 15% off through October 2011. Leave a separate comment for every $5 spent. 5. Like Ox Art Jewelry AND aquariann Art pages on facebook for one extra entry. 6. Follow Patsy's Artsy Place blog AND my blog on Google Friend Connect, Networked Blogs or your favorite RSS reader for one extra entry. I adore the Red Orange Mod Necklace - Bubbles Pendant! ps i love the post a comment section note , it's very creative and it's a wakeup call to those who type mean comments . I added the Green Enamel Art Nouveau Earrings to my favorites and I also liked her shop! My Etsy username is daniellevillano! so many beautiful items! i think that these are my favorite. I loved the Purple Crystal Silver Ring Antiqued! Looks great! I like the Turquoise Heart Necklace Front Close Enamel (among other faves)! Purple Black and White Butterfly Wing Earrings are my pick. The enamels are beautiful bright colours. Very stunning. I have liked the butterfly earrings. I have given her shop and my favourite item my heart. I think my favorite item from her shop is the West Highland Terrier Enamel Necklace. It's so pretty! I also liked this post! All the leaf earrings are so cute! I voted for the blog on picket fence. I love these Chartreuse Enameled Earrings. Green is my fav color! I <3's Chartreuse Enameled Earrings and Ox Original Art Jewelry on etsy. I'm gupsiesJewels there. I liked this post on facebook, I'm Dawn Baley Hausker there! My favorite was hard to narrow down! The winner: the Enamel Earrings - Handmade Autumn Leaf. Beautiful! Wow, I really like the purple black and white butterfly wing earrings. I think every girl had her butterfly phase. Very unique earrings. I think the Witch's Hat Pendant is CUTE! I like Enamel Pansy in yellow purple. I love the starfish necklace. It is beautiful. Love the turquoise heart necklace! I love the Purple Black and White Butterfly Wing Earrings! I like the Large Blue and Orange Butterfly Wings!! Added Blue and Orange Butterfly wings to my favorites, and hearted her shop on etsy! Just voted for your blog. I love the Rose Pink Art Nouveau necklace- thanks for the giveaway! I like the blue flower necklace. I love the silver and gold enamel necklace. I love the petite enamel drop earrings dainty! I love the Handmade Artists Palette Necklace in Enamel most of all!! I really liked large Butterfly Wing Earrings Blue Orange Black. Ups!!!! My first comment dissapear!!! I said my favoyrite item in your shop is "Turquoise Brown Earrings - Enameled LeavesFrom"
I like the Red Orange Autumn Leaf Pendant Handmade Enamel. I really like the turquoise heart necklace. Her stuff is beautiful! I really love all the leaf earrings. My favorite has to be the Art Nouveau Enamel Necklace Turquoise and Brown though. I love the Peridot n Bronze / Gold Necklace with Pearl Cluster. I love the Turquoise Enamel Necklace super cute! Love the turquoise rococo art nouveau necklace! I added my fav item to my favourites and i hearted the shop. my favorite item is the Artists Palette Necklace! my email is andnowitslight at gmail dot com! Liked the Bird of Peace Dove Necklace Enamel on Copper. There are 3 likes on it. Added item to favorites and hearted her shop. Autumn enamel & purple black white butterfly wings are awesome! I absolutely love the red and orange autumn leaf pendant. Fabulous color! I love the Turquoise Enamel Hearts Necklace Green Yellow.. those are my favourite colours! The Colorful Art Necklace - Abstract Original Painting is my favourite.. The Pink Enamel Butterfly Necklace with Ruby is delicious.. my favourite of course! Hi! These earrings are amazing! I liked your page on facebook. added both to favorites as HEARTing. shared the giveaway on fb page.